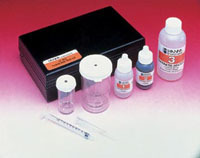 Chemetrics K-4585 total hardness kit. The kits tests total hardness in the range 100 - 1000 ppm as CaCO3 in increments: 100, 110, 120, 130, 140, 150, 160, 180, 200, 250, 300, 350, 400, 500, 700, 1000 ppm. 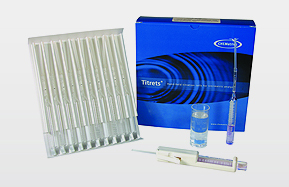 The kit contains everything needed to perform 30 tests: thirty ampoules with valve assemblies, titrettor, 25 mL sample cup, instructions, and MSDS.